So while the spring and summer of 1988 was one of the worst stretches of my life, a couple of good things did happen to me during that time. The first thing was that I started living on my own for the first time in my life, in an apartment at the corner of Wishon & McKinley in the Tower District. It was a bit expensive: $375 a month plus utilities, but my landlord often forgot to charge me for the utilities. The living room of that apartment was just big enough for a TV, a couch, and — oh yeah — my drum kit in the back corner, which was good, because of the other good thing that happened: one night, right around the time my band Blackbird Stories disintegrated for good, Ron “Doc” Morse walked up to me outside of the Olympic Tavern and told me he wanted to play music with me. And luckily, I had a drum kit in my living room and no roomates to annoy. So after a couple of one-off gigs with other friends billed as Candyass Pansies, in early 1989 Doc & I put a band together with Shawn Miller from Blackbird Stories on bass and my brother Joe on guitar. The band was called “Evil Twin” — a name that we came up with during a drunken evening at Goodbodys which I hated from the start — and to say that it never quite gelled would be an insult to chaos. While I remember that Doc & Joe’s guitars were pretty cool together, Shawn & I never quite worked well as a rhythm section, which wasn’t a problem in Blackbird Stories, but bugged the hell out of Doc to the point where he and Shawn fought a lot. To the point where where — after some machinations — Joe & Doc & I decided to try it as a three-piece, with Joe on bass. This was one of the key moments of my life: the three of us locked in almost instantly, and Sedan Delivery was born, with a stated aesthetic of crossing Neil Young & The Replacements. And remember: this was during that late-80s nadir just prior to Freedom, where only the die-hards were still onboard. Which was us, for the most part, otherwise, we wouldn’t have thought to try to bring some kind of form and “Tonight’s The Night,” a song that kinda resisted that. 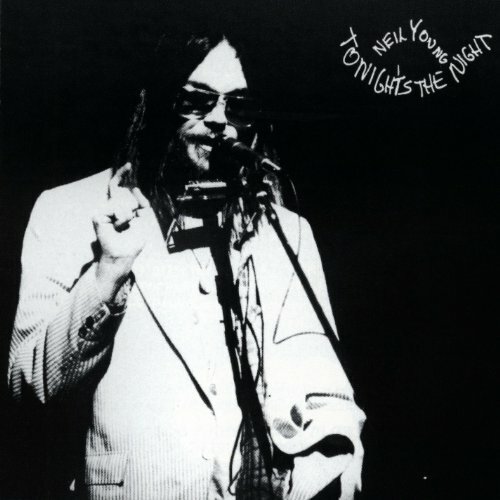 As the first song to have different versions open and close a Neil Young album, “Tonight’s The Night Part II” is really only slightly different from the version that opens the album: it’s probably a bit more ragged and a bit more rocking, it’s definitive moment arguably coming in the first minute when Nils continues his high harmony of “tonight’s the night” while Neil sings the first verse. It’s a mistake that egregious enough it would derail most artists, but of course Neil left it in, because it perfectly encapsulated the vibe of the album one last time. After that he mixes and matches the lyrics, the band alternates between pounding and restrained, and it finally just ends with one last strangled “ooohhhh” from Neil.